Karnataka is due for elections soon, and hence political hitjobs are an order of the day. Parties will try hard to upstage the other, and in the process, sometimes rely on dubious material. For example, last month, the Karnataka unit of the Congress claimed that BJP has in the past celebrated Tipu Jayanti. To prove this they circulated some pictures on social media. As it turns out, the pictures were of Iftar parties organised by the BJP minority morcha, and had nothing to do with Tipu Sultan. 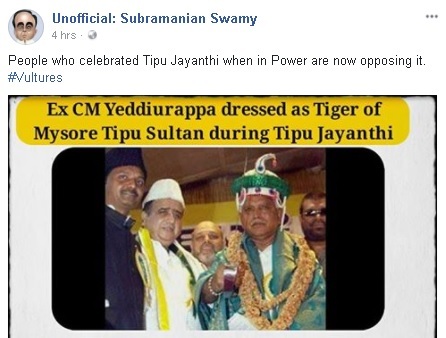 Co-founder of the alleged fact-checking site Altnews, a parody Facebook page tackily called Sususwamy too posted the picture, claiming that when Yeddyurappa was in power, he had celebrated Tipu Jayanti. A reverse search of the image revealed that this was not a new allegation. Last year during the time of Tipu Jayanti celebrations, this picture was circulated, but that time, it was released by a JDS leader Basavraj Horatti. Yeddyurappa had even then rejected the allegation stating that he had the picture was from some other event. A deeper reverse search revealed that the earliest instance of this picture on appearing online was the period between 30 March 2013 and 1 April 2013. Two stories on the internet used this picture (1) (2). The first story claimed that the picture was from the Karnataka Janata Paksha (KJP) Minority Convention, organized in Bangalore on March. 30, 2013. KJP was the party formed by Yeddyurappa after he split from the BJP. This story was published on 1st April 2013. From the above pictures, it is clear that what was being spread (even by alleged fact-checkers), as a picture of BS Yeddyurappa celebrating Tipu Jayanti, was in fact a picture from a minority convention. Further, the claim that Yeddyurappa was in power, when he “celebrated Tipu Jayanti” also fails, because in March 2013, KJP had just been launched and was waiting to win its first seats in the May 2013 assembly elections. Further, the practice of celebrating Tipu Jayanti in Karnataka, was started only in 2015. In November 2015, the Congress Government in Karnataka had announced that henceforth, Tipu Sultan’s birth anniversary will be celebrated. While one can expect political parties to spring such traps, and laymen to fall in them, it is odd how alleged self-proclaimed “fact-checkers” spread propaganda without verifying the facts.